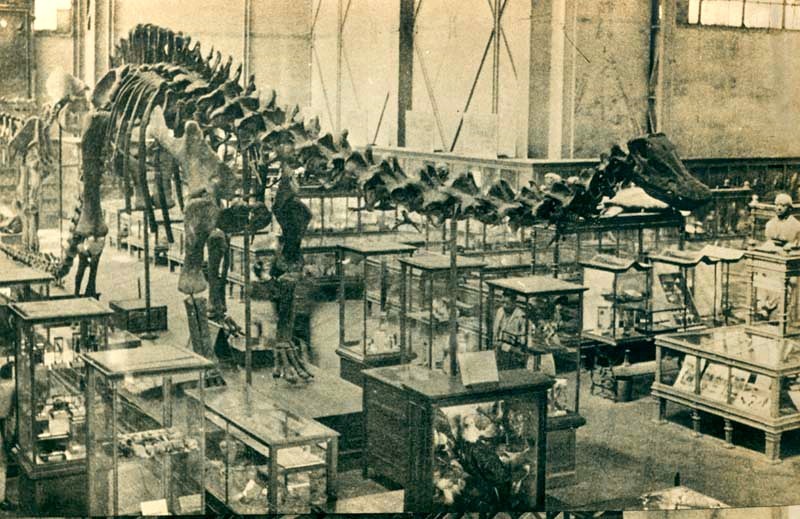 It’s time to revisit my sporadic series on organizational and interpretive approaches in large-scale paleontology exhibits. Check out the posts below if you’d like to catch up. Today’s topic is immersive exhibits – walk-through artificial environments that realistically simulate the prehistoric world. There are plenty of examples, and notably most have been built in the last 30 years. 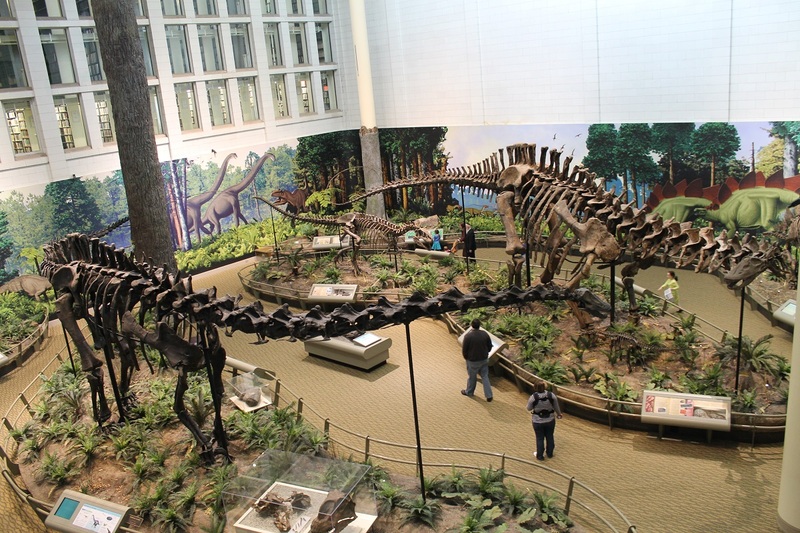 The Cincinnati Museum Center has a reconstruction of the Ohio Valley during the Pleistocene. The centerpiece at the Sternberg Museum of Natural History is an indoor forest presided over by an animatronic Tyrannosaurus rex. Probably the most dramatic example is the DinoSphere at the Children’s Museum of Indianapolis. Here, a repurposed Imax theater contains a number of dynamically posed dinosaur skeletons standing among rocks and trees. The surround sound system provides a constant soundtrack of animal calls, while the projection screen shows the sky at different times of day on a 22-minute cycle. There are even periodic storms, complete with flashing lights and booming thunder. Stan and Bucky harass a Triceratops in the DinoSphere. Exhibits like the DinoSphere and its kin are frequently derided as sensationalism with little educational value. These multi-million dollar special effects shows (which sometimes do not contain any genuine specimens at all) are plainly inspired by the successes of theme parks, and it’s easy to dismiss them as crass efforts to draw crowds with flashy gimmicks. Surely these exhibits are nothing more than misguided attempts to turn museums into entertainment, learning opportunities be damned? Well, it depends. The role of spectacle in museums is a complex one, and arguably one that is impossible to decouple from the core identity of these institutions. 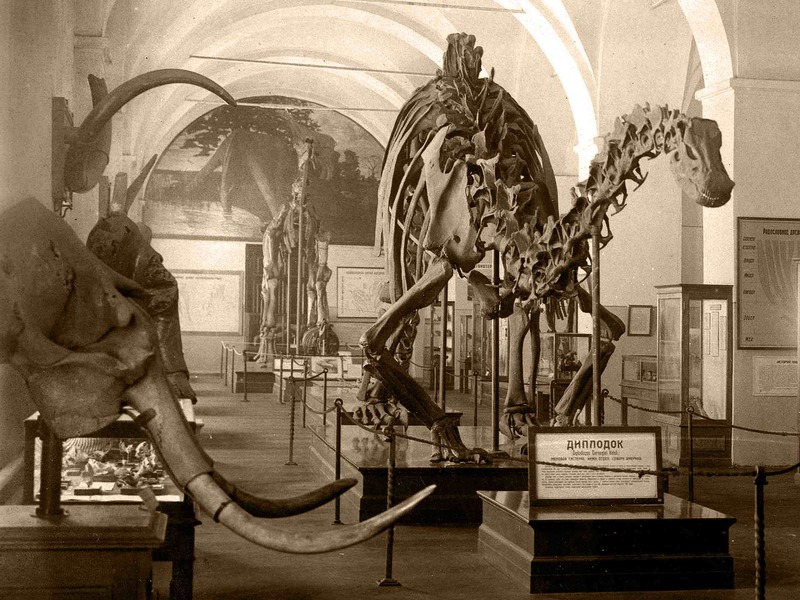 Going back to the enlightenment-era cabinets of curiosities from which modern natural history museums emerged, the public side of museums has always been about showing off the biggest, the rarest, or the most expensive. And this sensationalist modus operandi has often been reflected in the spaces where specimens are displayed. The Greco-Roman architecture of classic exhibit halls, for example, is no less artificial than the DinoSphere’s indoor thunderstorms, and serves pretty much the same purpose. The neoclassical aesthetic of the Field Museum’s great was designed to impress – and is no less of a fabricated experience then the DinoSphere above. Photo by the author. While spectacle in museums is nothing new, neither is its complicated relationship with education. Arresting displays have long been leveraged to imbue specimens with informative context. Take habitat dioramas populated by taxidermy animals, a longstanding staple of natural history museums. These little worlds behind glass first became popular in the mid 19th century, and were almost immediately controversial among museum workers. Paradoxically, dioramas provided visitors with a fuller appreciation of the ecosystems the animals lived in, but only by wrapping the specimens in a layer of theatrical artifice. 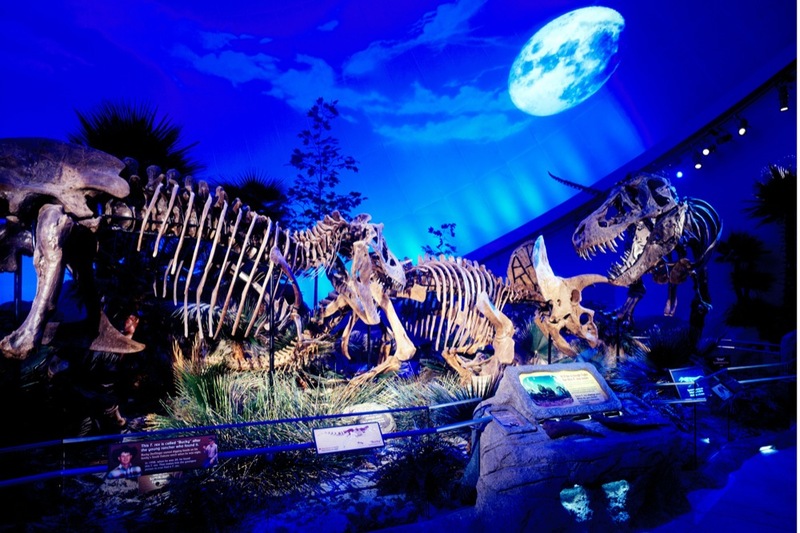 The immersive fossil exhibits that have cropped up over the last few decades are essentially habitat dioramas on a larger scale, and exhibit designers are still wresting with the same issues their forebears did a century and a half ago. Which is more important in the context of public exhibits – an informative and meaningful narrative, or authenticity? For me, spectacle and artifice are fine, even welcome, so long as they serve a purpose. In some cases, the spectacle exists to inform (as in a habitat diorama), in other cases the spectacle itself is the attraction. 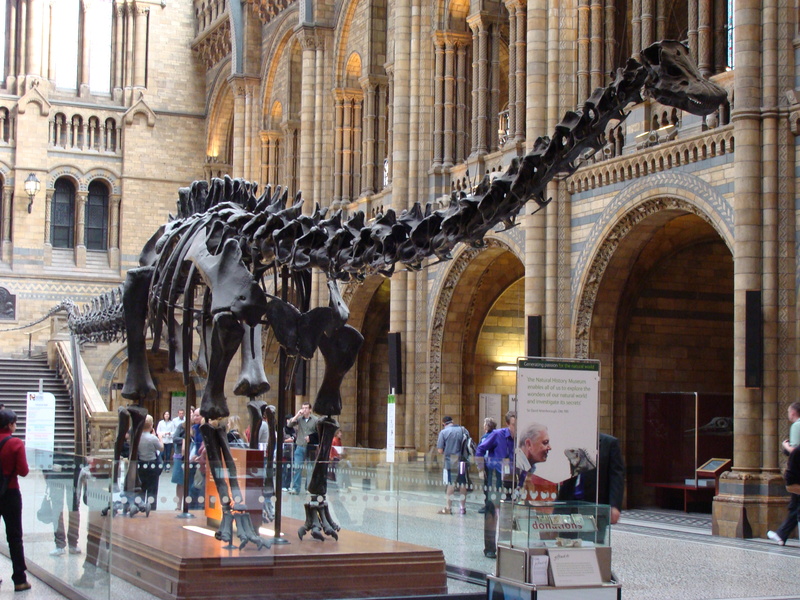 The robotic T. rex at the Natural History Museum in London and the neanderthal photo booth at the National Museum of Natural History come to mind as examples of the latter – they’re entertaining, but don’t facilitate any further reflection or inquiry. When implemented in a thoughtful and deliberate way, however, spectacle can be a powerful element in a museum educator’s toolkit. 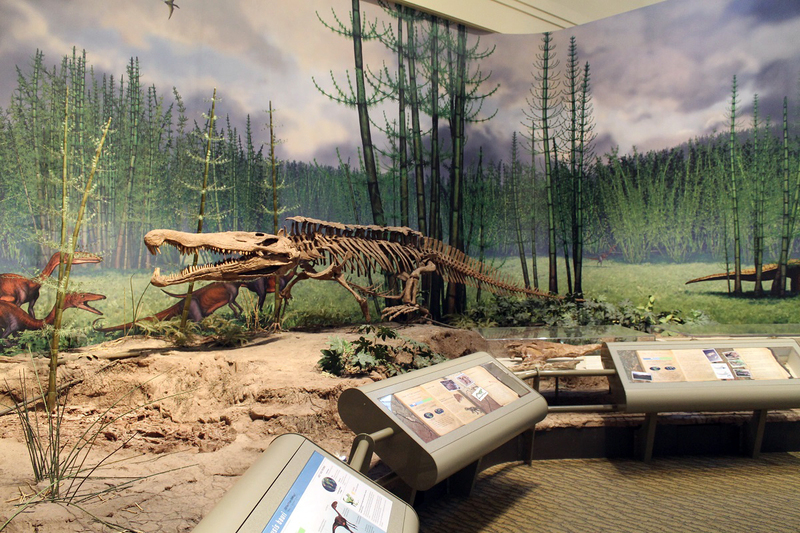 By design, the first big skeleton visitors see in Dinosaurs in Their Time isn’t a dinosaur – it’s the phytosaur Redondasaurus. Photo by the author. Let’s look at one example of a habitat immersion exhibit that uses showy reconstructed environments to maximize its educational potential. Two years and $36 million in the making, “Dinosaurs in Their Time” at the Carnegie Museum of Natural History is, in my opinion, one of the absolute best paleontology exhibits in the world*. 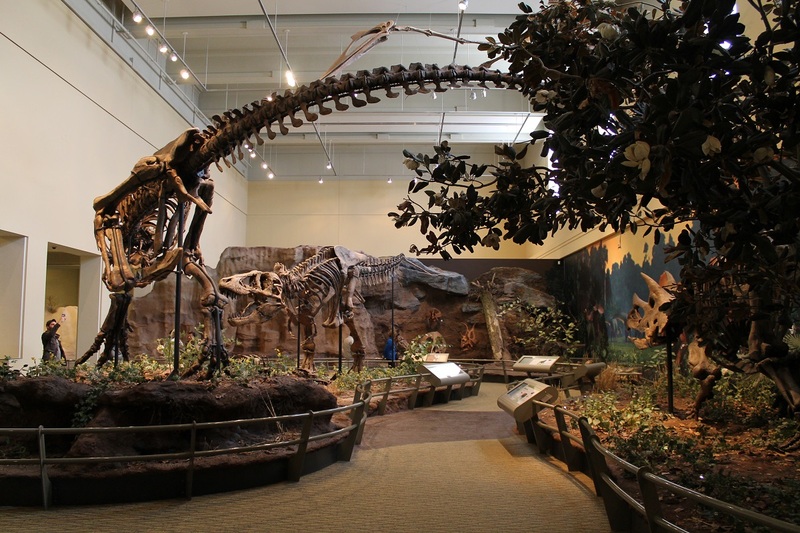 Whether you’re considering the scope and quality of the specimens on display, the aesthetics and layout, or the interpretive approach, Dinosaurs in Their Time is a benchmark in natural history exhibit design. You can follow along with this nifty interactive map. *To be absolutely fair, Dinosaurs in Their Time is focused exclusively on the Mesozoic, which makes it difficult to compare to larger exhibits that cover the entire history of life on Earth. What makes Dinosaurs in Their Time so great? Let’s start by considering the layout. The new exhibit more than doubles the square footage of the old Carnegie dinosaur hall, and much of the interior is actually a former courtyard (incidentally, this reuse of an existing space helped the exhibit earn its LEED certification). This makes the gallery spacious and airy, with a high ceiling and plenty of natural lighting. The exhibit is arranged chronologically, starting in the Triassic and ending in the Cretaceous, but there is plenty of space in which to roam. 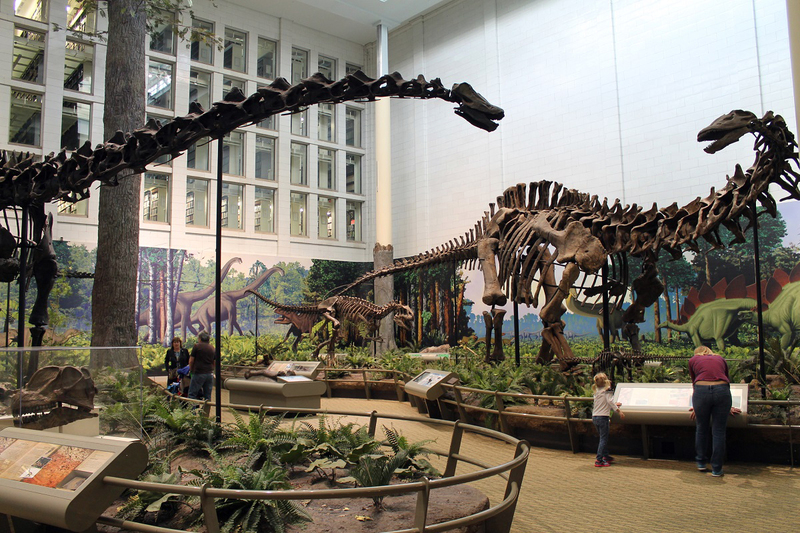 In fact, the pathway forms a sort of figure eight around the Apatosaurus and Diplodocus in the Jurassic zone and the Tyrannosaurus pair in the Cretaceous. This cyclical organization allows, if not encourages, visitors to view specimens from multiple perspectives, and lets each person traverse the exhibit at their own pace. 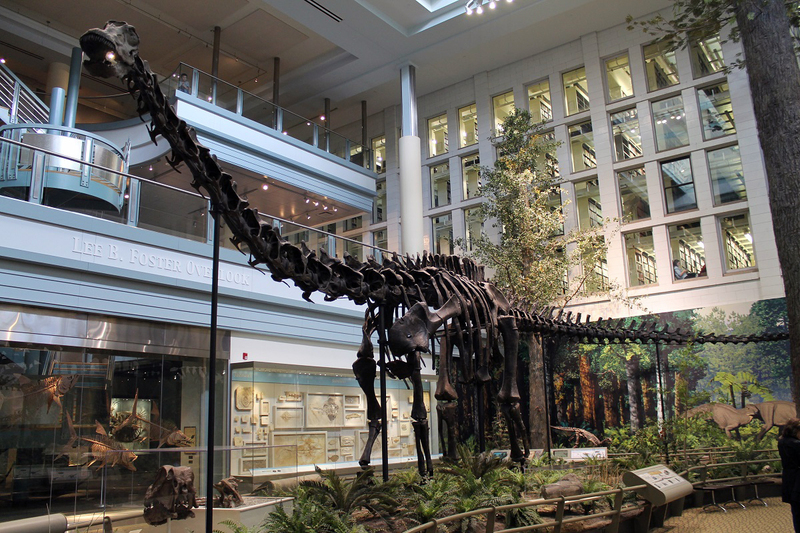 It’s especially nice that the sauropods have enough room to breathe – too often, these immense skeletons are relegated to cramped quarters where it’s impossible to see them all at once. 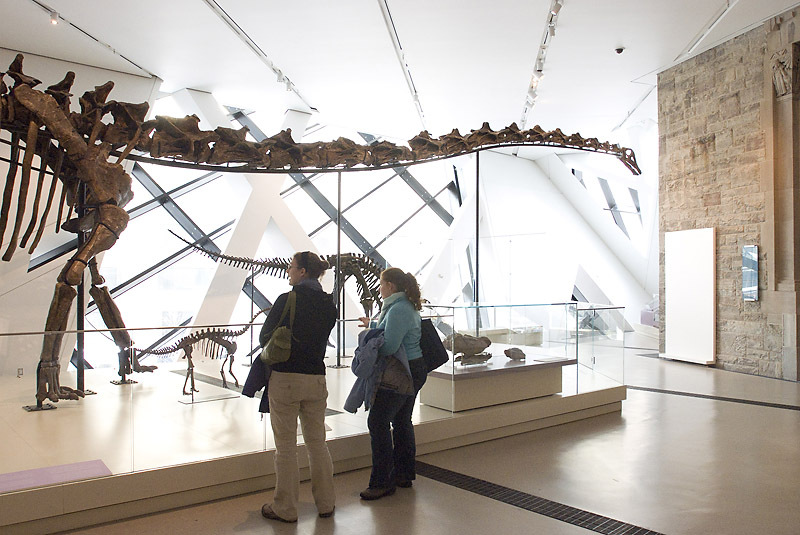 Visitors can walk all the way around Apatosaurus and Diplodocus, and even view them from above. Photo by the author. The open spaces and clear sight lines are nicely complemented by the reconstructed rocks and foliage that fill the exhibit, giving it a proper outdoor feel. Importantly, the flora isn’t just for show – it’s a critical component of the interpretation. “We’ve painstaking recreated the worlds of the dinosaurs,” curator Matt Lamanna explains in a Carnegie Magazine interview, “everything that is displayed together actually lived together.” One of the key themes in Dinosaurs in Their Time is that dinosaurs were but one part of rich ecosystems, which were just as complex as those of today. These animals shaped and were shaped by the world around them, and there is far more to paleontology than the pageant show of toothy monsters that many visitors have come to expect. Indeed, it’s more akin to reconstructing entire worlds. The plurality of “worlds” is important, because Dinosaurs in Their Time also emphasizes the nigh-unfathomable time span of the Mesozoic. Over 185 million years, countless communities of organisms came and went, and once again the immersive aesthetic of the exhibit helps convey this. While the horsetail swamp of the Triassic area almost looks like an alien world, the Cretaceous is populated by flowers and deciduous trees much like those of today. In this exhibit, the fossil specimens aren’t in a neutral environment – the space itself is part of the narrative. Tyrannosaurus and Triceratops mounts stand among flowers and magnolias. Photo by the author. The habitat immersion approach comes with yet another plus: it encourages exploration. From a tiny swimming Hyphalosaurus under the waterline of an artificial pond to a Rhamphorhynchus halfway up a tree, visitors are constantly rewarded for looking high and low. As Lamanna explains, “many visitors are repeat visitors, so we wanted to give them something new to discover every time they come back.” This is particularly beneficial for younger visitors. Rather than barreling through the exhibit in minutes, kids are encouraged to look for tiny details and learn things along the way. Finally, the computer terminals throughout Dinosaurs in Their Time merit some discussion because they embody the same multi-tiered educational approach as the physical space around them. Dinosaurs in Their Time actually tells several stories simultaneously: there’s the ecology story, the deep time story, the history of the specimens on display, and even a meta-story of how the new exhibit was put together. Most visitors won’t be interested in every narrative, nor should they be. Rather than filling the walls with a dizzying array of signage, the exhibit designers consolidated the various narratives into space-efficient interactives. Visitors can choose which information they would like to see, and craft their experience in the exhibit to their tastes. This is technology used intelligently and purposefully, and something I hope to see other exhibits emulate in the future. 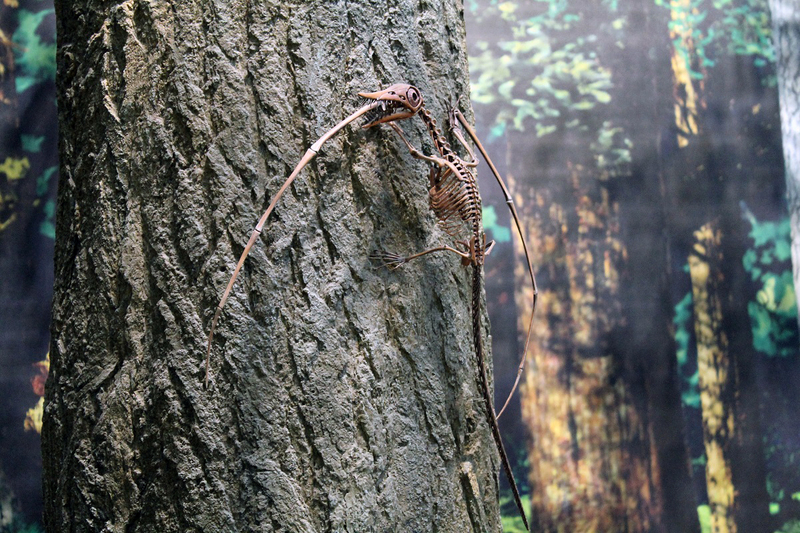 Sharp-eyed visitors are rewarded with hidden specimens, like this Rhamphorhynchus halfway up a tree. Photo by the author. The purpose of any exhibit structure is to provide meaning and context for objects – to help visitors see them as more than neat things to look at. It’s the museum’s job to give visitors the intellectual tools to contextualize displayed objects in a more sophisticated way. Spectacle is one way to achieve that goal, and Dinosaurs in Their Time is a stellar example. McGinnis, H.J. (1982). 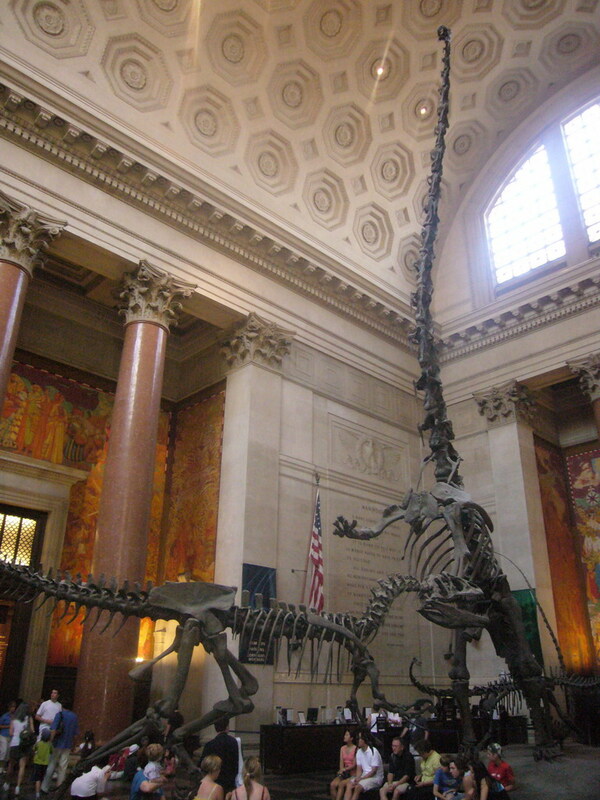 Carnegie’s Dinosaurs: A Comprehensive Guide to Dinosaur Hall at Carnegie Museum of Natural History, Carnegie Institute. Pittsburgh, PA: Board of Trustees, Carnegie Institute. 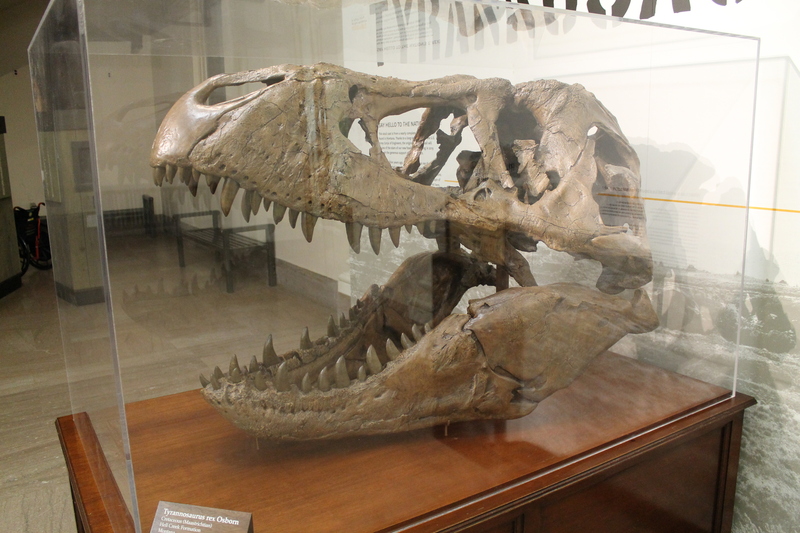 Old meets new: The classic Carnegie T. rex (CM 9380) is now paired with a cast of Peck’s Rex (MOR 980). Photo by the author. Start with Displaying the Tyrant King – Part 1. 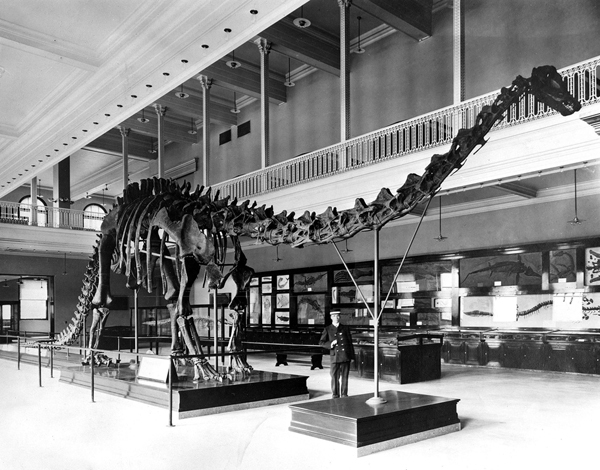 In 1915, the American Museum of Natural History unveiled the first mounted skeleton of Tyrannosaurus rex ever constructed. 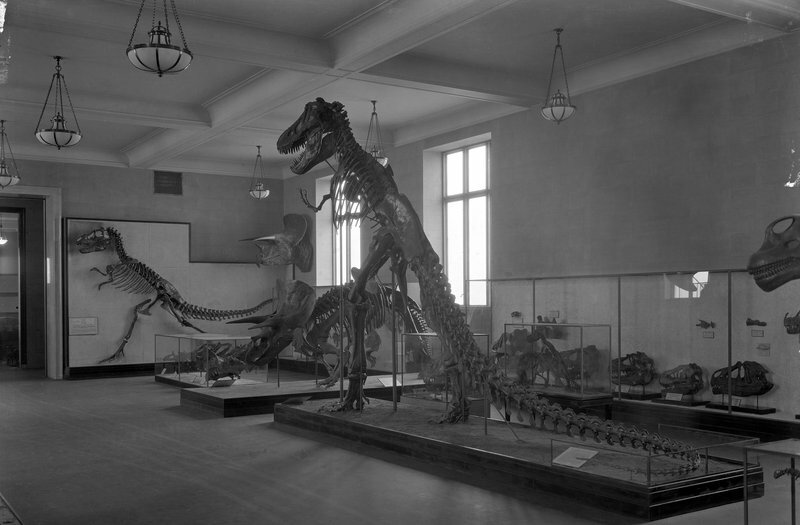 The Carnegie Museum of Natural History followed suit with their Tyrannosaurus mount in 1941, and for most of the 20th century New York and Pittsburgh were the only places in the world where the tyrant king could be seen in person. Nevertheless, these displays propelled Tyrannosaurus to universal stardom, and the instantly recognizable dinosaur appeared in countless books, films, and other media for years to come. The omnipresence of T. rex was secured in part by two additional museum displays, ironically at institutions that did not have any actual Tyrannosaurus fossils on hand. 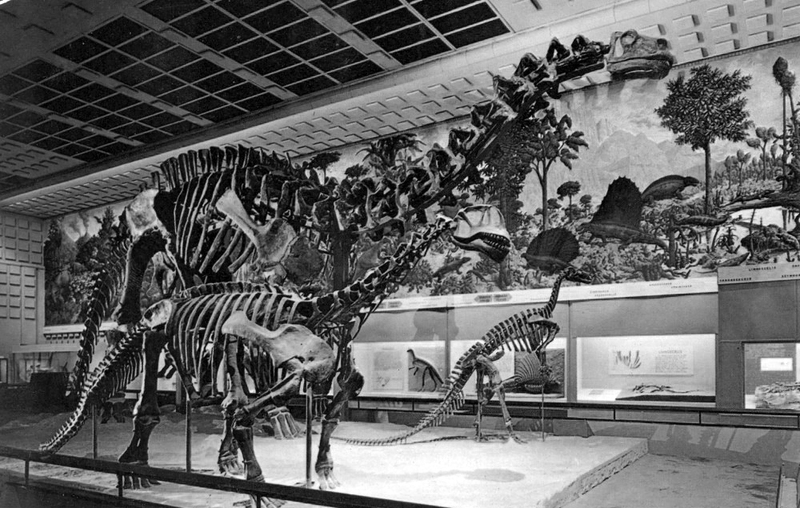 The Field Museum of Natural History commissioned Charles Knight to paint a series of prehistoric landscapes in 1928, the most recognizable of which depicts a face-off between Triceratops and a surprisingly spry Tyrannosaurus. In 1947, Rudolph Zallinger painted a considerably more bloated and lethargic T. rex as part of his Age of Reptiles mural at the Peabody Museum of Natural History. Both paintings would be endlessly replicated for decades, and would go on to define the prehistoric predator in the public imagination. 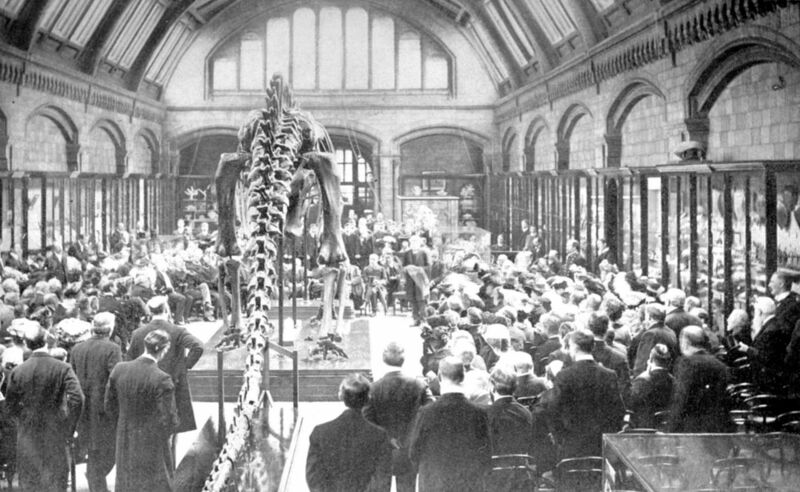 Despite enduring public enthusiasm, scientific interest in dinosaurs declined sharply in the mid-20th century, and new discoveries were few and far between. 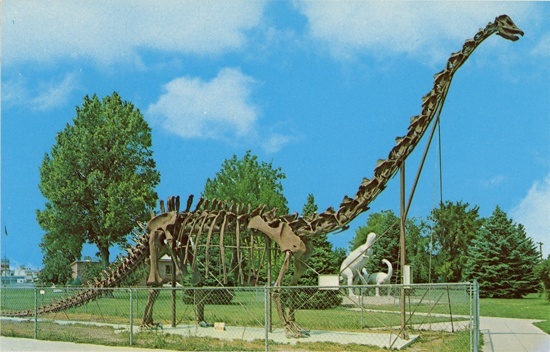 This changed rather suddenly with the onset of the “dinosaur renaissance” in the 1970s and 80s, which brought renewed energy to the discipline in the wake of evidence that dinosaurs had been energetic and socially sophisticated animals. 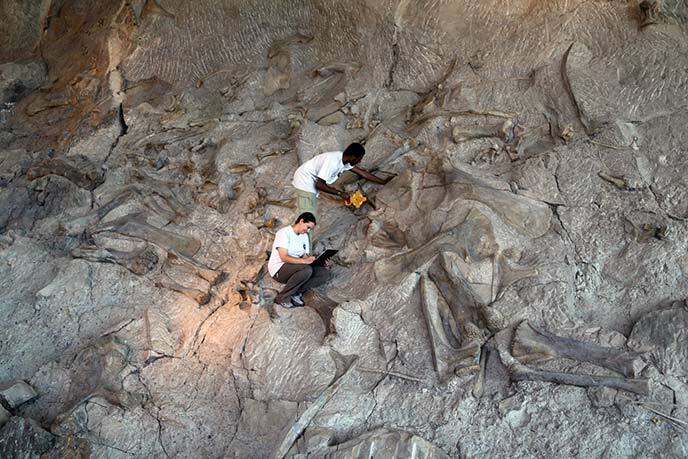 The next generation of paleontologists endeavored to look at fossils in new ways to understand dinosaur behavior, biomechanics, ontogeny, and ecology. 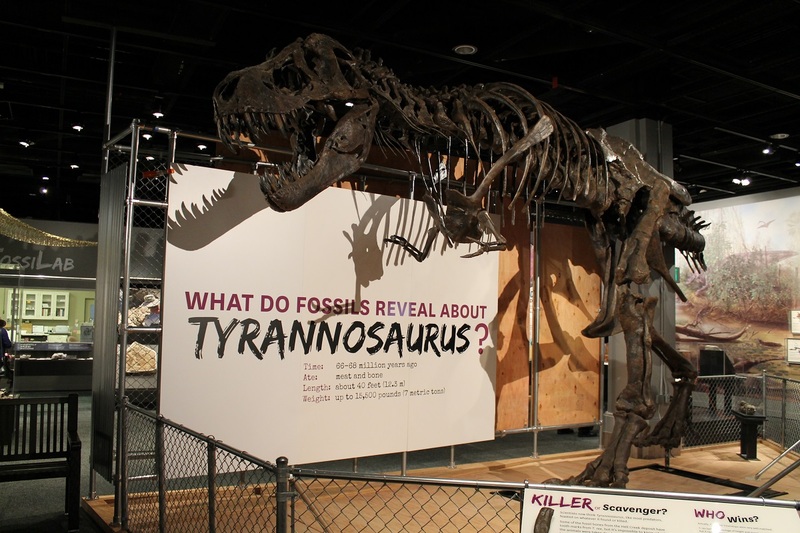 Tyrannosaurus was central to the new wave of research, and has been the subject of hundreds of scientific papers since 1980. More interest brought more fossil hunters into the American west, leading to an unprecedented expansion in known Tyrannosaurus fossils. Once considered vanishingly rare, Tyrannosaurus is now known from over 50 individual specimens across a wide range of ages and sizes. Extensive research on growth rate, cellular structure, sexual dimorphism, speed, and energetics, to name but a few topics, has turned T. rex into a veritable model organism among dinosaurs. The most celebrated Tyrannosaurus find from the early years of the dinosaur renaissance came from Alberta, making it the northernmost and westernmost T. rex to date. 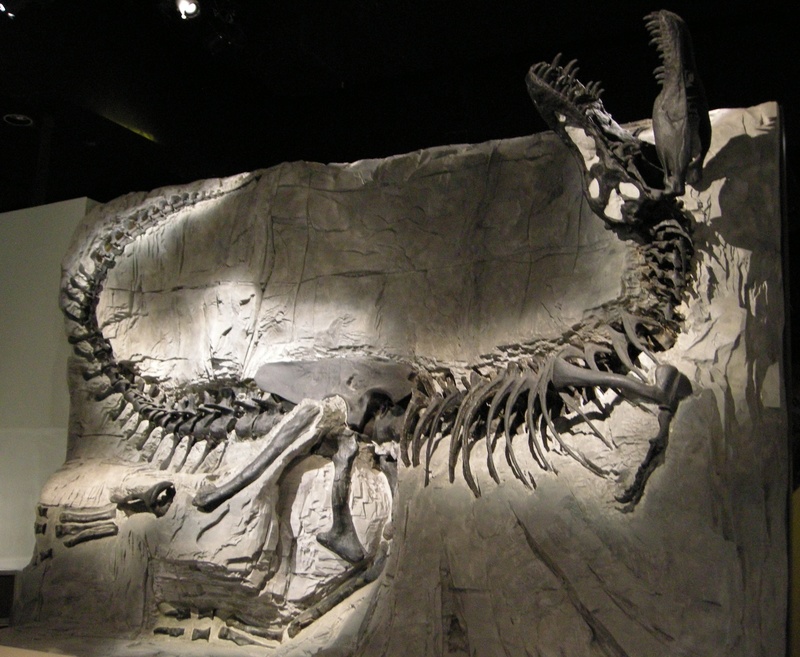 The 30% complete “Black Beauty” specimen, so named for the black luster of the fossilized bones, was found in 1980 by a high school student and was excavated by paleontologist Phil Curie. 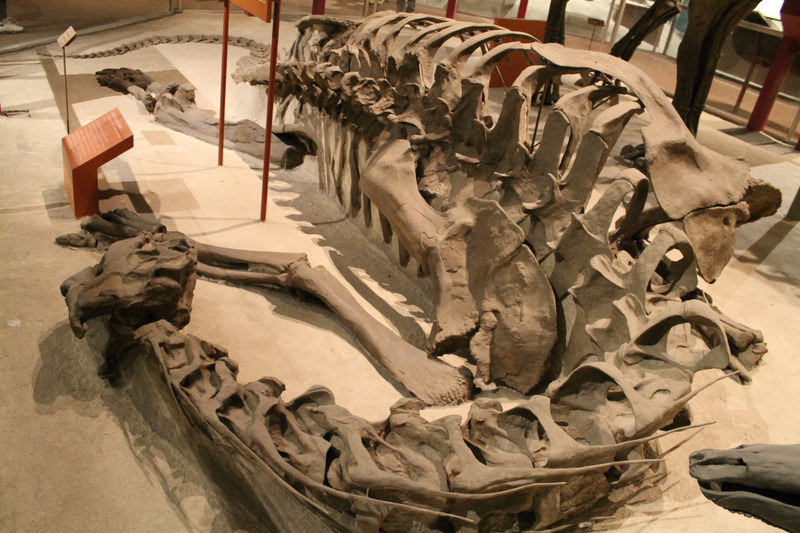 The original Black Beauty fossils were taken on a tour of Asia before finding a permanent home at the newly established Royal Tyrell Museum in Drumheller, Alberta. 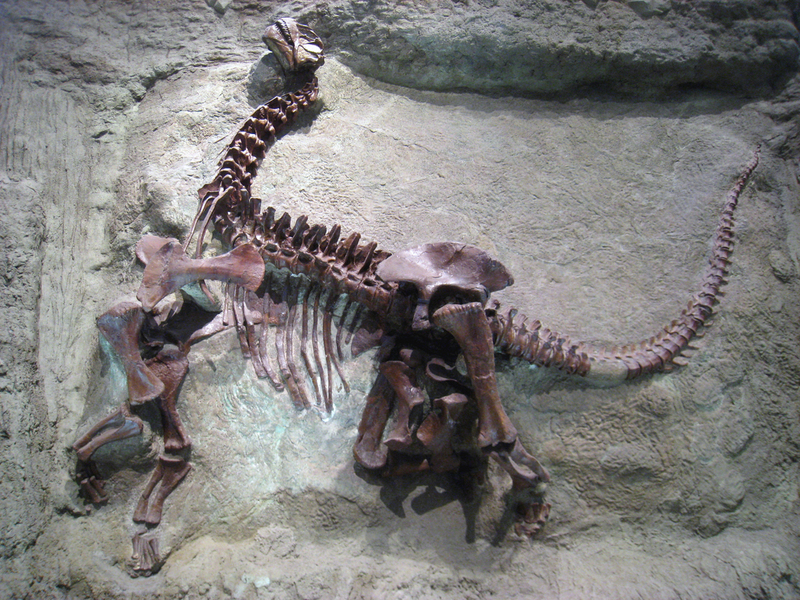 In lieu of a standing mount, Black Beauty was embedded in a faux sandstone facade, mirroring the environment in which the fossils were found and the animal’s presumed death pose. 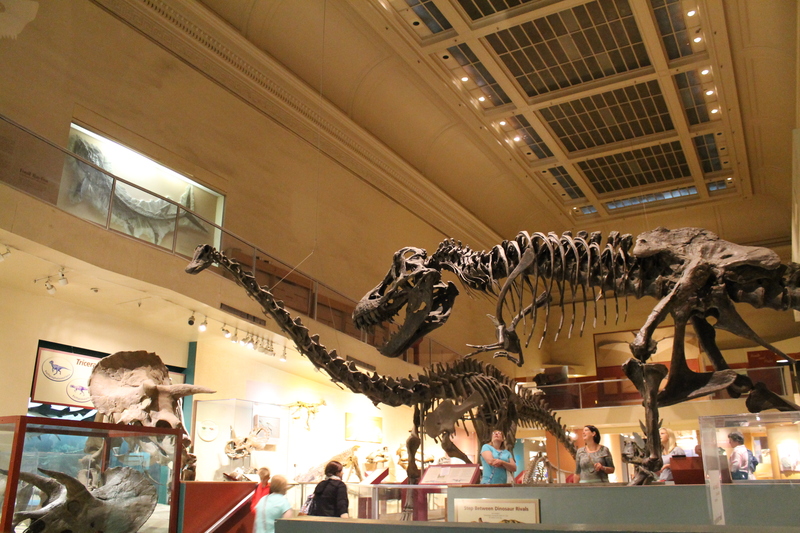 This relief mount set Black Beauty apart from its AMNH and CMNH predecessors, and even today it remains one of the most visually striking Tyrannosaurus displays. 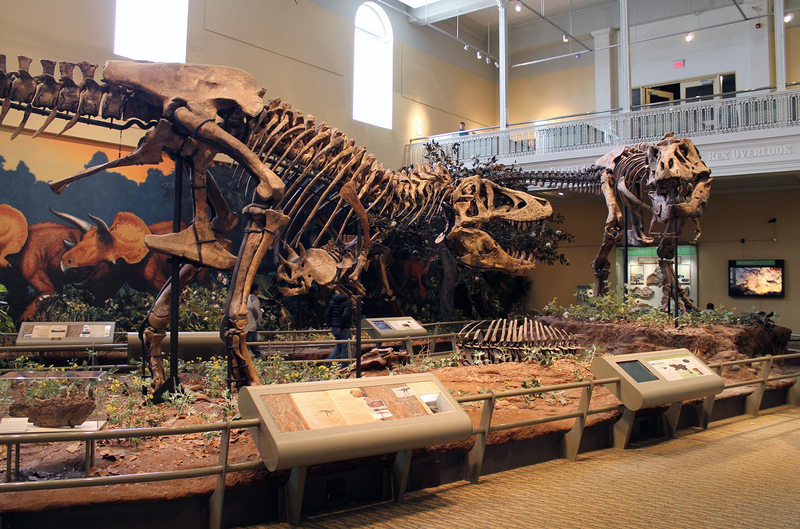 Since the original specimen consisted of less than half of a skeleton, much of this display is made up of sculpted bones, including the pelvis, scapula, and most of the ribs. 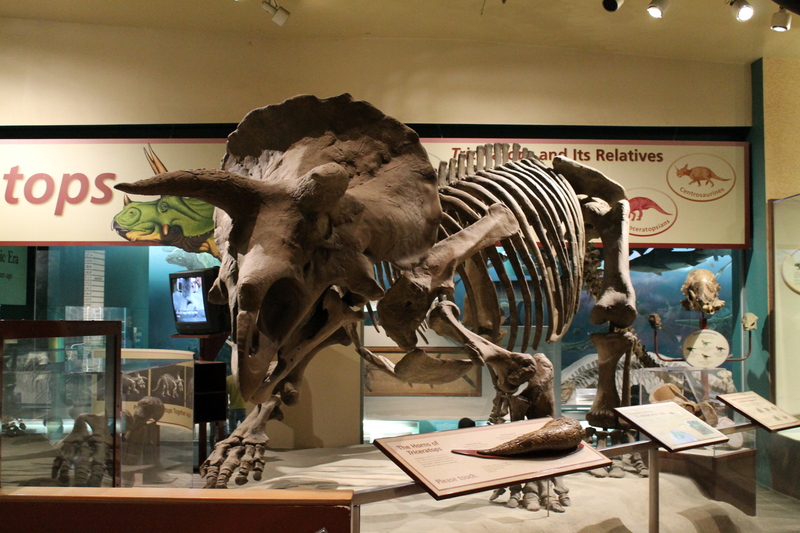 The mounted skull is a cast, but the real skull is displayed behind glass nearby. 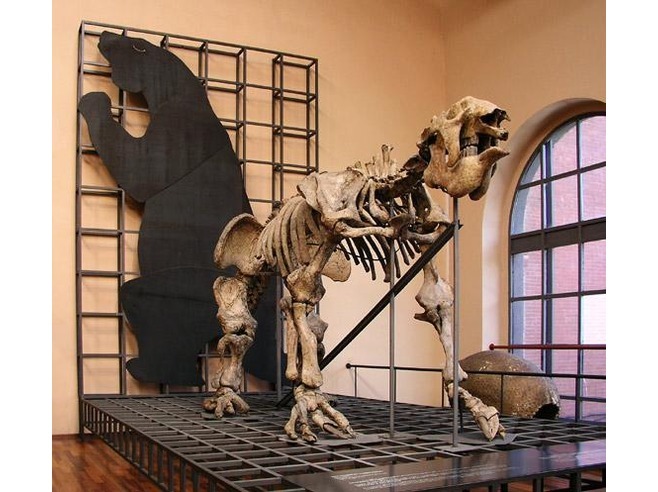 A complete cast of Black Beauty in a traditional free-standing mount is also on display at the Swedish Museum of Natural History in Stockholm. 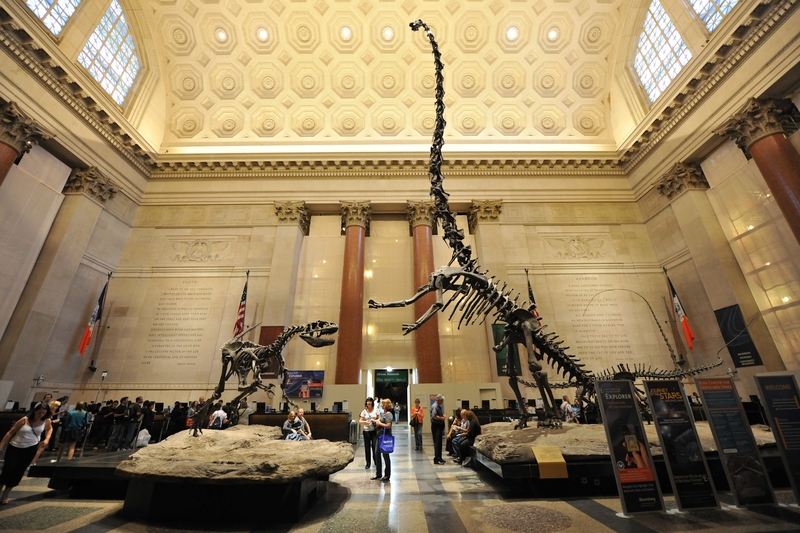 Driven by the increased public demand for dinosaurs, many museums without Tyrannosaurus fossils of their own have purchased complete casts from other institutions. 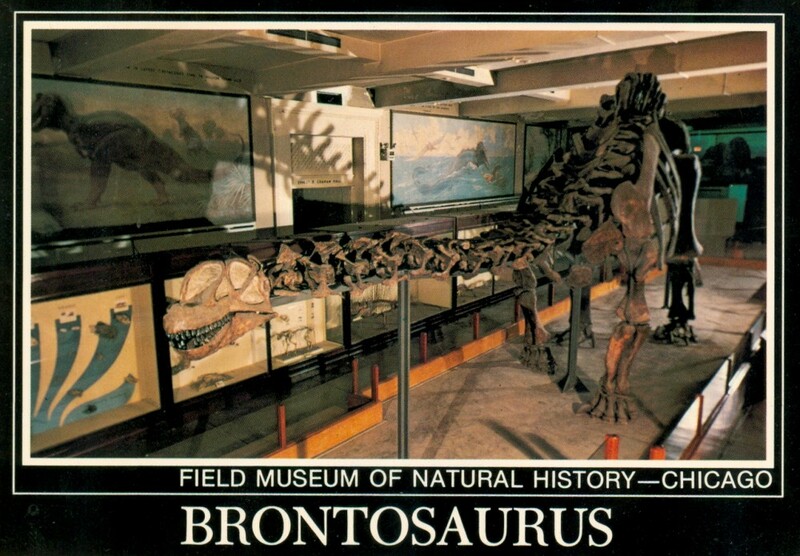 In 1986, the Academy of Natural Sciences in Philadelphia opened “Discovering Dinosaurs”, the world’s first major exhibit showcasing active, endothermic dinosaurs. 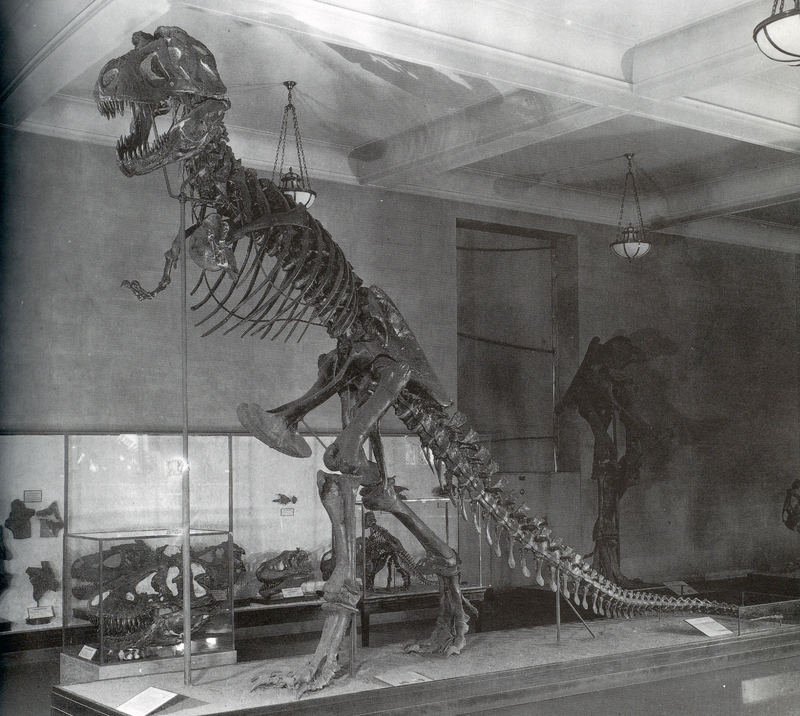 The centerpiece of the exhibit was a cast of the original AMNH Tyrannosaurus, posed for the first time in the horizontal posture that we now know was the animal’s habitual stance. 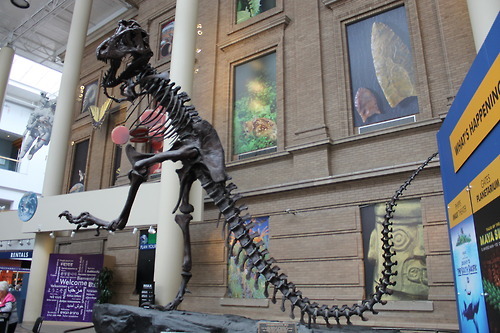 The following year, another AMNH cast appeared in the lobby of Denver Museum of Nature and Science in a strikingly bizarre pose, with one leg kicking high in the air. The mount’s designer Robert Bakker intended to push boundaries and demonstrate what a dynamic and energetic Tyrannosaurus might be capable of, although the mount has subsequently been described as dancing, kicking a soccer ball, or peeing on a fire hydrant. Meanwhile, The Royal Tyrell Museum prepared a mount of RTMP.81.12.1 (a specimen consisting of a relatively small number of postcranial bones) that was filled in with AMNH casts, including the highly recognizable skull. 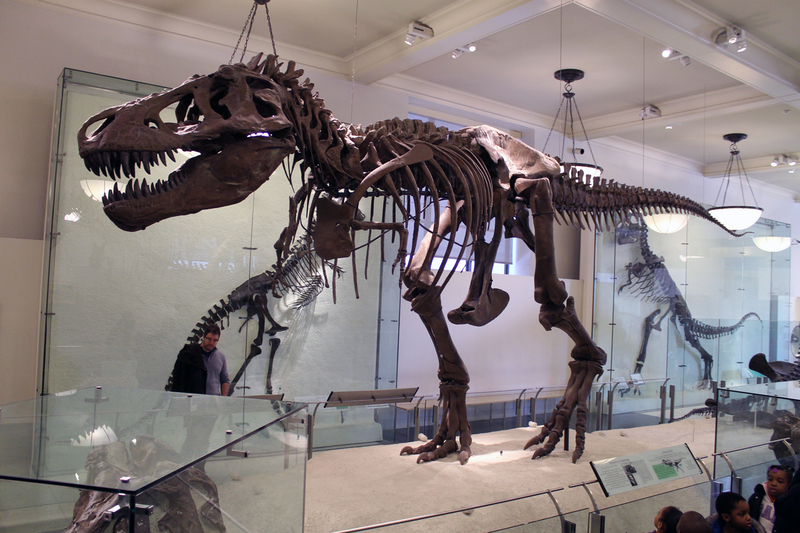 Since the late 1990s, however, casts of another specimen have overtaken AMNH 5027 for the title of most ubiquitous T. rex. BHI 3033, more commonly known as Stan, was excavated in South Dakota in 1992 by the Black Hills Institute, a for-profit outfit specializing in excavating, preparing, and mounting fossils. 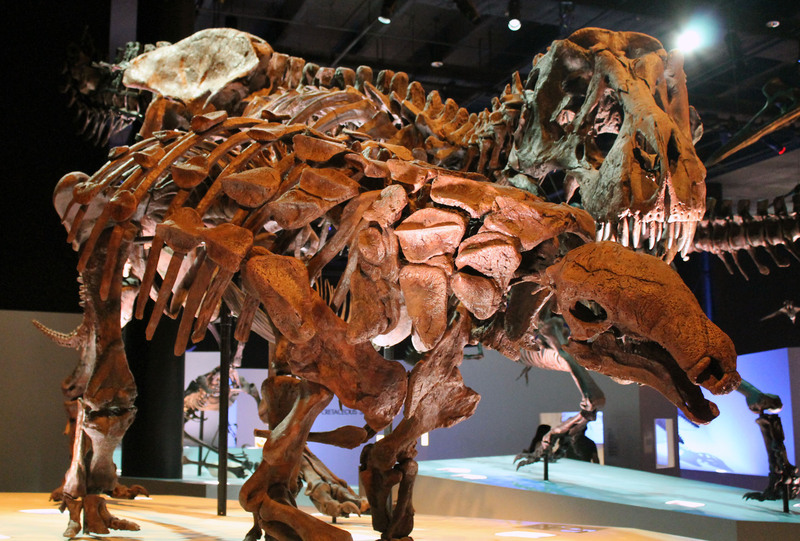 Stan is significant for being over two-thirds complete and for including the best-preserved Tyrannosaurus skull yet found. BHI has sold dozens of casts of the Stan skeleton to museums and other venues around the world. At a relatively affordable $100,000 plus shipping, even small local museums and the occasional wealthy individual can now own a Tyrannosaurus mount. 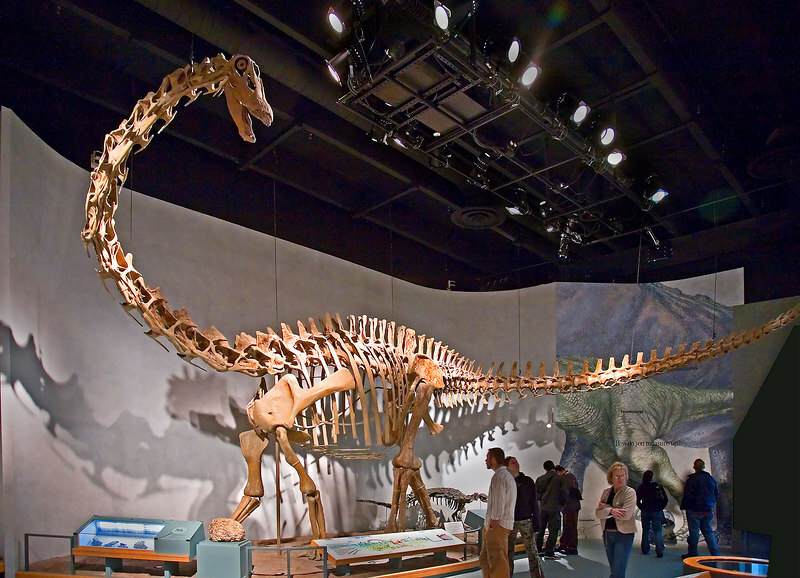 With over 50 casts sold as of 2017, Stan is, by a wide margin, the most duplicated and most exhibited dinosaur in the world. Stan the Tyrannosaurus at the National Museum of Natural History. Photo by the author. All these new Tyrannosaurus mounts are forcing museums to get creative, whether they are displaying casts or original fossils. 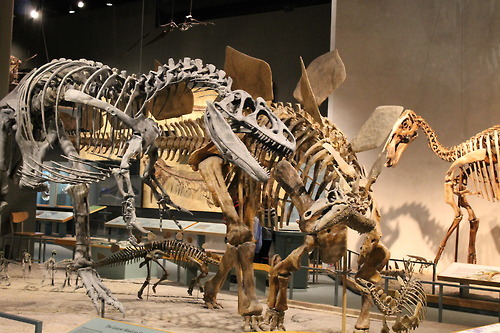 Predator-prey pairings are a popular display choice: for example, the Houston Museum of Natural Science T. rex is positioned alongside an armored Denversaurus, and the Los Angeles Natural History Museum matches the tyrant dinosaur with its eternal enemy, Triceratops. Meanwhile, the growing number of juvenile Tyrannosaurus specimens has allowed for family group displays. 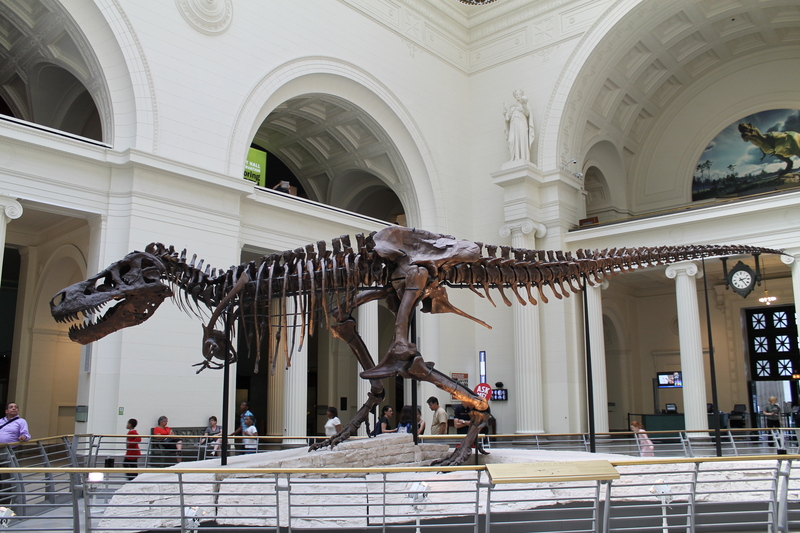 A second T. rex exhibit at LACM features an adult, subadult and baby, while the Children’s Museum of Indianapolis pairs a Stan cast with the original skeleton of Bucky, a “teenage” T. rex. 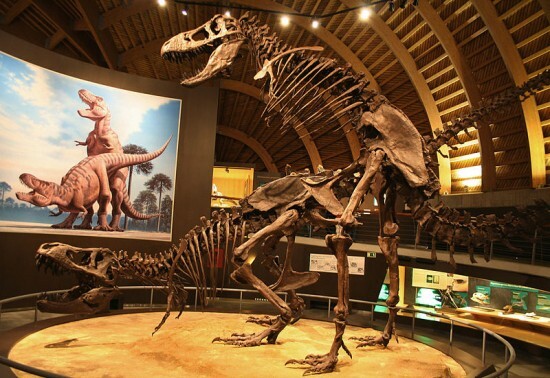 The most unique Tyrannosaurus mount so far is certainly the copulating pair at the Jurassic Museum of Asturias. Tyrannosaurus versus Denversaurus at the Houston Museum of Nature and Science. Photo by the author. 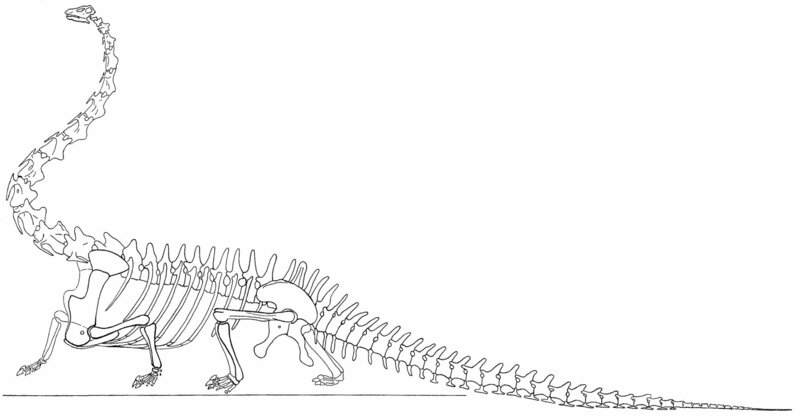 Each of these displays gives a substantially different impression of Tyrannosaurus. Depending on the mount, visitors might see T. rex as a powerful brute, a fast and agile hunter, or a nurturing parent (or a gentle lover). Each mount is accurate insofar that a real Tyrannosaurus probably adopted a similar stance at some point, but the museum’s choice of pose nevertheless influences visitors’ understanding of and attitude toward the dinosaur. 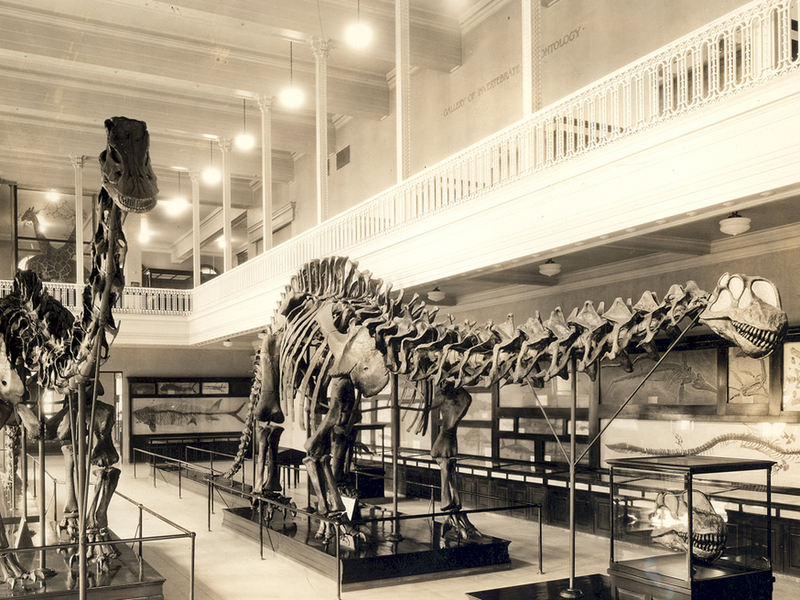 With dozens of new Tyrannosaurus mounts springing up across the country and around the world, the original AMNH and CMNH displays began to look increasingly obsolete. Unfortunately, modernizing historic fossil mounts is an extremely complex and expensive process. The early 20th century technicians that built these displays generally intended for them to be permanent: bolts were drilled directly into the bones and gaps were sealed with plaster that can only be removed by manually chipping it away. What’s more, the cumulative effects of rusting armatures, fluctuating humidity, and vibration from passing crowds have considerably damaged historic mounts over the course of their decades on display. 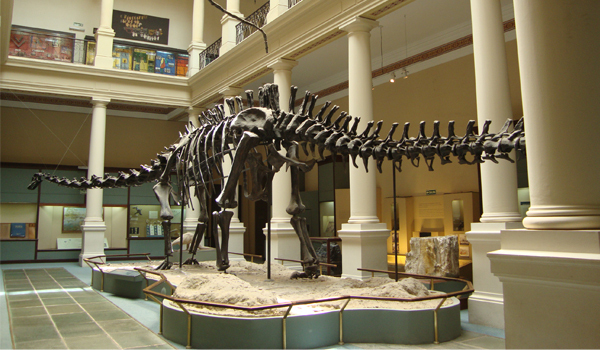 AMNH 5027 was restored and remounted in 1995. Photo by the author. 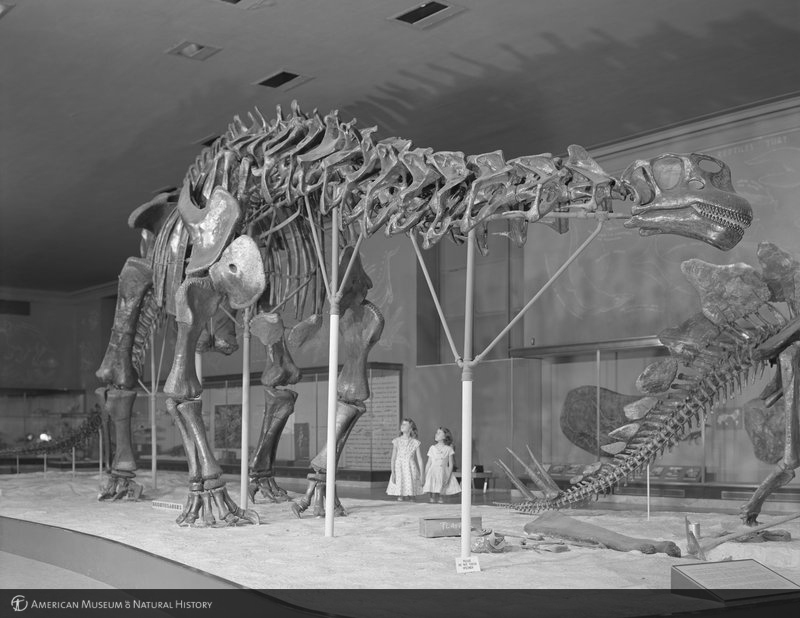 Despite these challenges, AMNH and CMNH have both been able to restore and update their classic Tyrannosaurus displays. While fossil mounts used to be built in-house, often by the same people who found and described those fossils, modern mounting projects are typically outsourced to specialist companies. Phil Fraley Productions, an exhibit fabrication company based in the Pittsburgh suburbs, was responsible for both T. rex restorations. At AMNH, Jeanne Kelly spent two years disarticulating and conserving each bone before Phil Fraley’s crew took over to build the new armature. 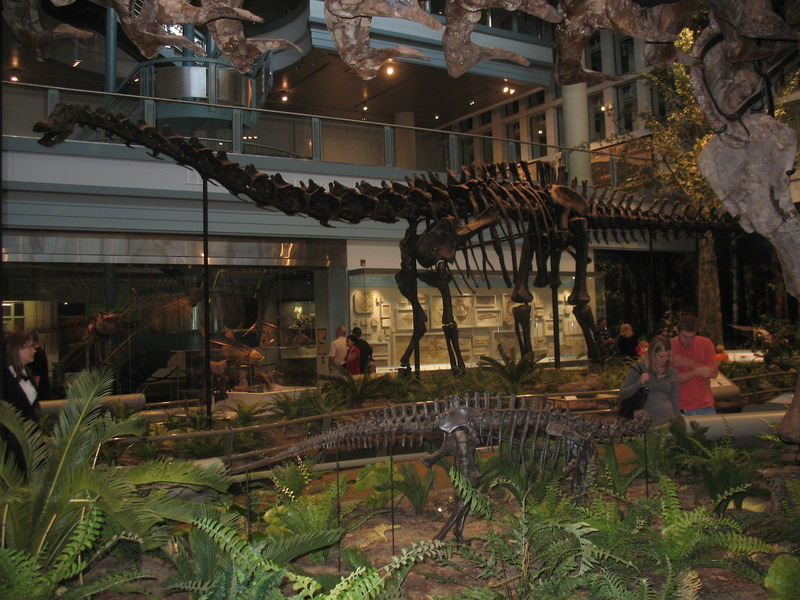 The new mount not only corrected the dinosaur’s posture, but improved visitors’ view of the fossils by removing obstructive vertical supports. 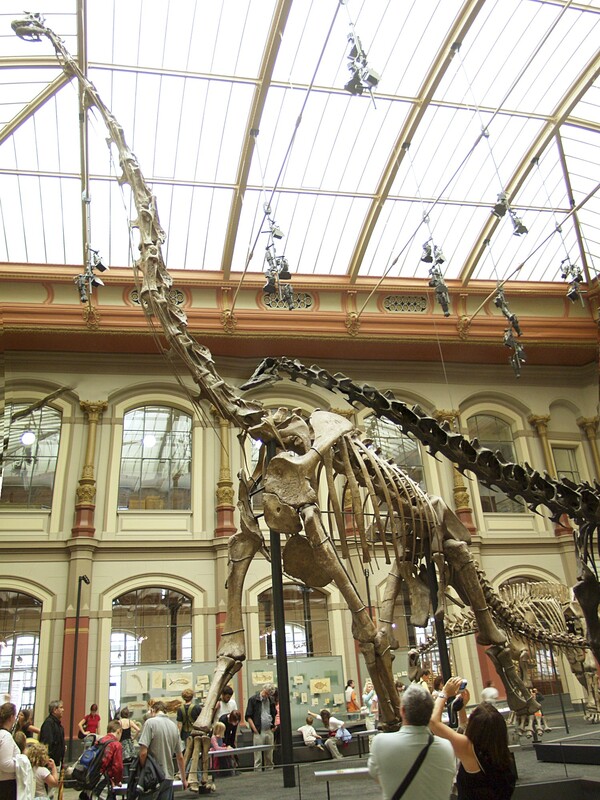 Instead, most of the skeleton’s weight is now supported by steel cables hanging from the ceiling. Each bone is secured to an individual metal bracket, allowing researchers to easily remove elements for study as necessary. A new cast of the skull was also prepared, this time with open fenestrae for a more natural appearance. Rather than attempting to match the dramatic and showy T. rex mounts at other museums, the AMNH team chose a comparatively subdued stalking pose. A closed mouth and subtly raised left foot convey a quiet dignity befitting this historically significant display. 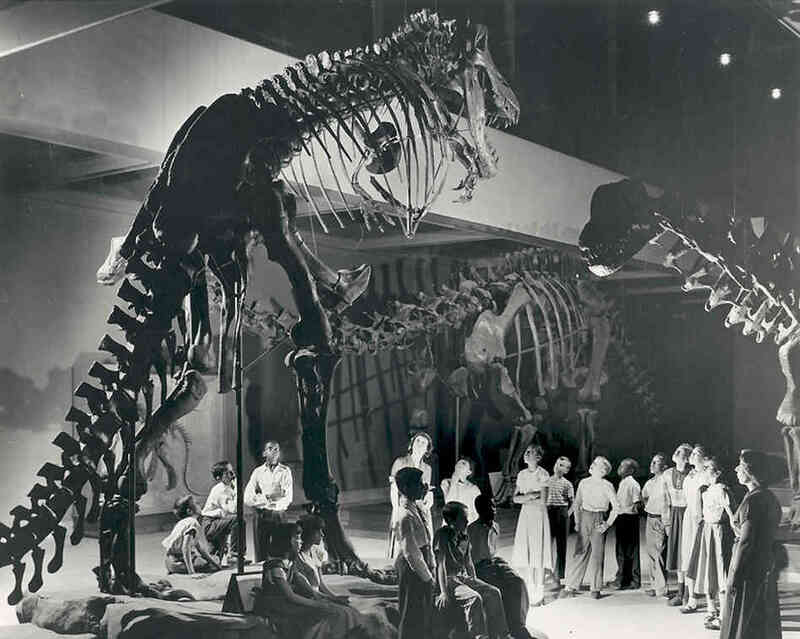 Historically, the 1941 CMNH Tyrannosaurus had never quite lived up to its New York predecessor. Although it incorporated the Tyrannosaurus type specimen, it was mostly composed of casts from the New York skeleton, and it sported an unfortunately crude replica skull. It is therefore ironic that CMNH now exhibits the more spectacular T. rex display, one which finally realizes Osborn’s ambitious plan to construct an epic confrontation between two of the giant predators. 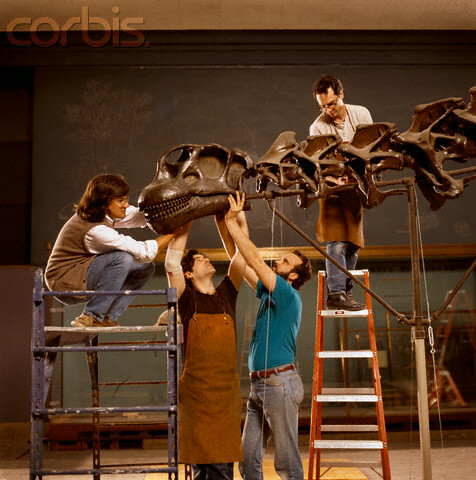 As they had with the AMNH mount, Phil Fraley’s team dismantled the original display and painstakingly removed many layers of paint, shellac, and plaster from the bones. 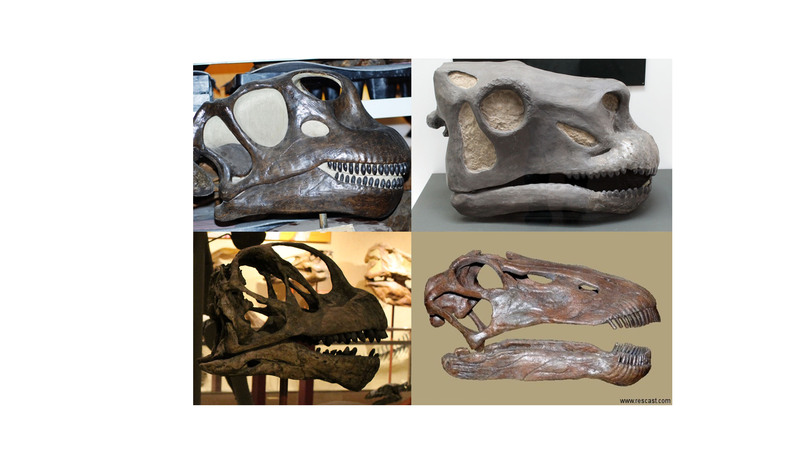 Michael Holland contributed a new restored skull, actually a composite of several Tyrannosaurus skulls. 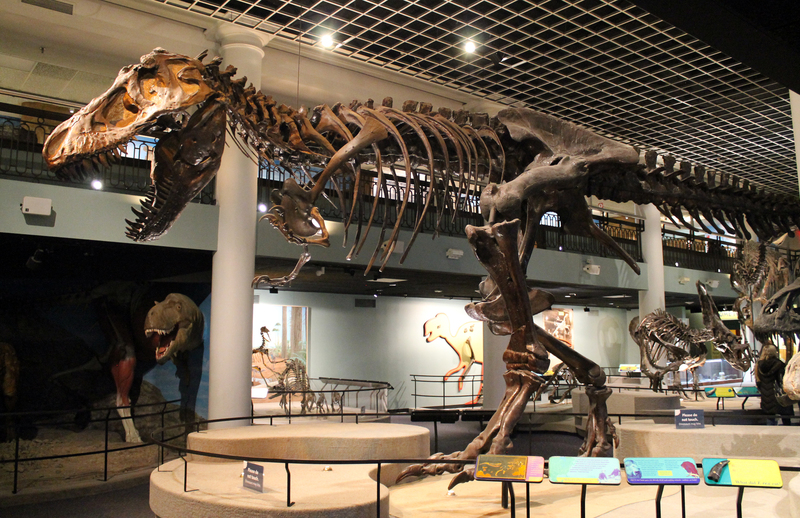 The restored holotype T. rex now faces off with a cast of “Peck’s Rex”, a specimen recovered from Montana in 1997. Despite the difficulty of modernizing the historic specimen, the team reportedly developed a healthy respect for turn of the century mount-makers like Adam Hermann and Arthur Coggeshall, who developed the techniques for making enduring displays of fragile fossils that are still being refined today. Continue to Displaying the Tyrant King Part 3. Colbert, E.H., Gillette, D.D. and Molnar, R.N. “North American Dinosaur Hunters.” The Complete Dinosaur, Second Edition. Brett-Surman, M.K., Holtz, T.R. and Farlow, J.O., eds.Bloomington, IN: Indiana University Press. Johnson, K. and Stucky, R.K. 2013. “Paleontology: Discovering the Ancient History of the American West.” Denver Museum of Nature and Science Annals, No. 4. Norell, M., Gaffney, E.S. and Dingus, L. 1995. Discovering Dinosaurs: Evolution, Extinction, and the Lessons of Prehistory. Berkeley, CA: University of California Press. Psihoyos, L. 1994. Hunting Dinosaurs. New York, NY: Random House, Inc.